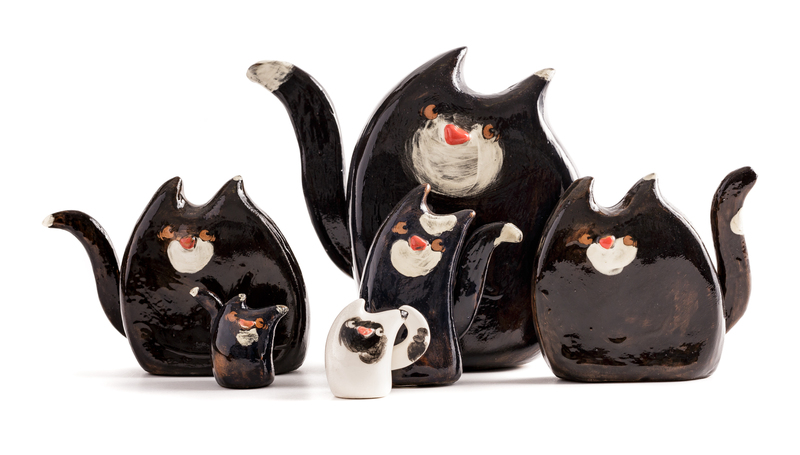 These small sculptures of stylised cats in animated positions, which are available in different sizes, reveal the fairy-tale imagination of this ceramic artist. They are individually made in ceramic and decorated with slip, glazing and enamel. This large glazed ceramic picture forms part of the personal artistic path of this craftswoman, dedicated to the female world and its iconic figures. The dreamy faces of these small sculptures with wind-swept hair are light-heartedly evocative of a rich fairy-tale world. Made of ceramic with plastic additions and slip and crystal decorations, these faces have ever-changing details. These inventive seedling pots are designed to be hung on walls, either individually or combined so as to form unusual compositions. Handcrafted in ceramic with slip, glazed or enamelled and with engraved motifs, these pots are available in various shapes, designs and colours. 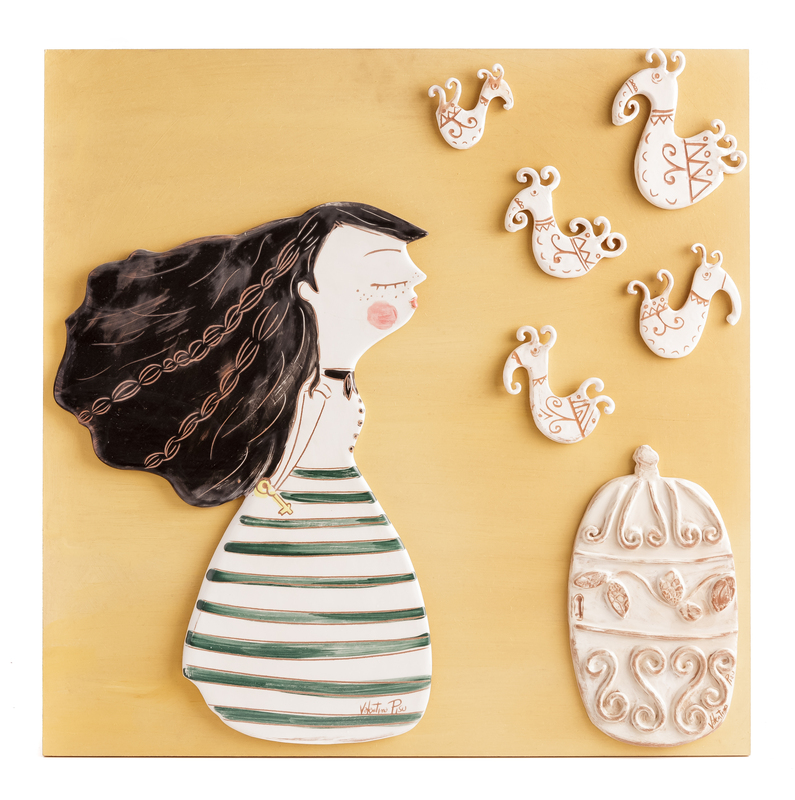 This picture with ceramic modules depicts a little girl setting lapwings free, adding a breath of life to one of the typical designs of the Sardinian iconographic tradition. In Valentina Pisu’s ceramics, recognisable for the distinctive dreamlike features, different forms of art are intermingled, linked to her personal research carried out through the study and practice of pottery and illustration. This young ceramist, whose stylistic language places her among the new interpreters of the artistic craft of the island, studied pottery at the Art School of Oristano, then attended the course in illustration at the International School of Comics in Reggio Emilia. Building on her wide-ranging experience and courses, Valentina reverted to tradition setting up her own workshop in Oristano, a renowned traditional ceramic manufacturing centre, thus developing, in tune with her own feelings, a new narrative code which is descriptive of a delicate magical world. Highly committed in the territory of interest, she takes part in the main local and international fairs and art events and she is also the creator of a ceramic course for children that draws inspiration from the educational value of fairy tales combined with the expressive means of handcrafting to bring objects to life. Populated by little girls lost in reveries and stylised cats with a distinctive graphic line, Valentina Pisu’s ceramics enchant us with their graceful narrative spirit. 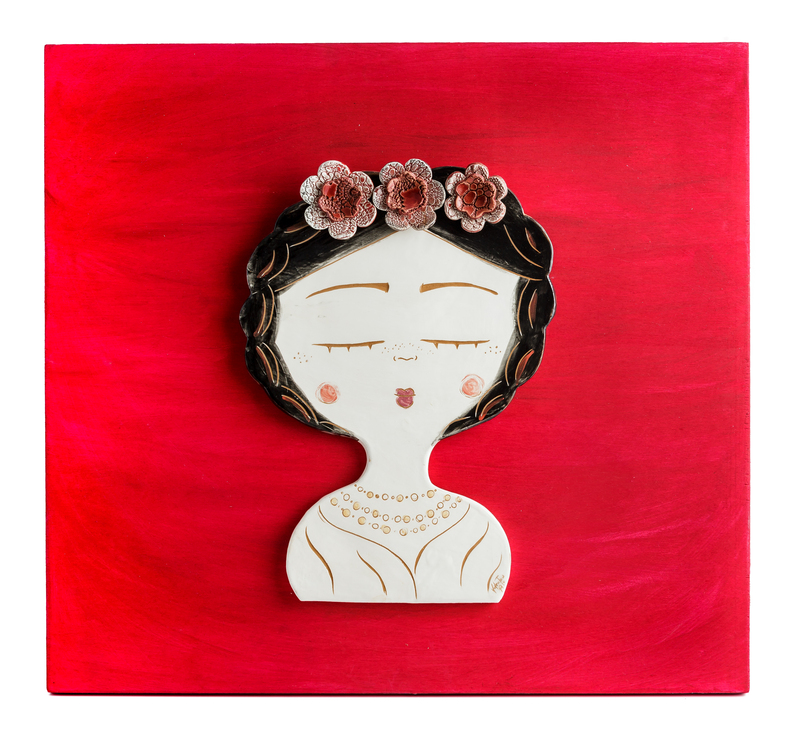 The representative collection of pictures, made in glazed ceramic on wooden support, reproduces characters capable of telling a long story with only a few elements. There is also the line of small sculptures of little girls and stylised animals and the original line of small seedling pots designed to be hung on walls. Every single item is a one-off creation, as each of them differs in inspiration, formal solution and use of colour. Valentina handcrafts her pottery starting from a graphic sketch drawing. She shapes her pictures starting from the sheet of clay, which she cuts and engraves, whilst the small sculptures can be either manual plastic shaped or molded. Colours are obtained with slip and enamel. Some items are lathe shaped.